What followed was a link to an article I had written, but it wasn’t on my site. It was on another company’s website. There were a few minor changes, but it was 90% the same. They had even copied one of the comments and added it as a comment on their post. It turns out, this company had copied more than 20 articles, mostly from a web design firm called Newfangled, but also from Blair Enns. It was Mark from Newfangled who spotted it. Together, we decided to contact them. Blair sent a email demanding they take down the articles and recommending that they take down their entire blog. The full email is posted at the end of this article. It’s absolutely worth reading. Their first response? “We didn’t know that was plagiarism. We thought everyone does that.” So let’s get that out of the way. What exactly is plagiarism? pla·gia·rism (noun): The practice of taking someone else’s work or ideas and passing them off as one’s own. Pretty clear. If you make it sound like you wrote it, but you didn’t, and hold it out as your own with no citation, no link, or attribution, that’s unlawful and you enter the world of copyright infringement. Had they cited the work and linked back to the authors, it would likely have been legit. How do I know if my content is being used unlawfully? This is the home page of the Versions Design website, with the plagiarized content highlighted. This tool also tells you how many words were copied and what percentage of the page. How fitting that the company name is “Versions.” It’s a version of Orbit content! To prove that you are the actual author, you can use the Way Back Machine to show who used the content first. Why stop with the content when you can copy the entire website? This is classic. Here’s one that copied more than our content, they copied the entire design! The layouts, the navigation, the position and dimensions of the elements, all of it. Every aspect of our lead generation website was copied. Carbon copy or an amazing coincidence? It’s not even that they liked the general design, but they substantially copied nearly every aspect of the Orbit site. How could this be anything but plagiarism? Wait, their button is blue. …how original. Believe it or not, we’ve seen this happen to four client websites in the past few years. 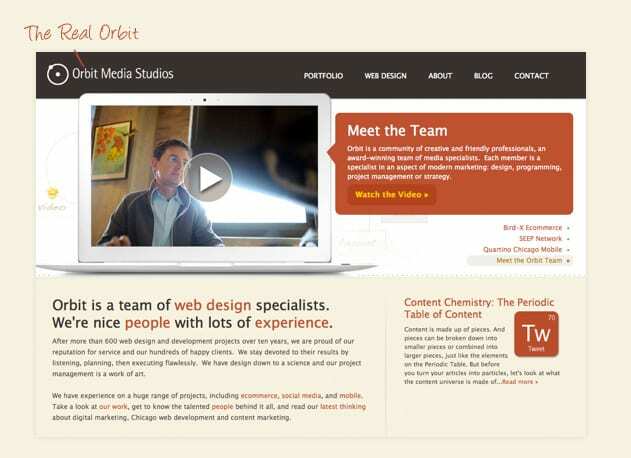 Each time, the client’s website was completely copied, with only some of the content changed. In one case, they didn’t bother to remove the Google Analytics code when they posted the copy! Pretty easy to find that one. Send a Cease and Desist letter. This is the first step in the legal process, but not necessarily the last. Hopefully, it’s enough and they quickly remove the content and contact you with a contrite response. Notify their Chamber of Commerce, if they belong to one. File complaint with the Better Business Bureau. UPDATE: The BBB doesn’t handle anything other than “marketplace activity.” In other words, if it’s not between a vendor and a client, it doesn’t affect the rating. Amazingly, the plagiarists mentioned above still have an A+ rating in the BBB. Keep this in mind the next time you’re impressed by a high BBB rating. Write a one-star review on their Google place page. Start by finding the listing in Google Maps, then click the big, red “Write a Review” button. Send a “Take Down” letter to their host, requesting that the site be taken down immediately under the Digital Millennium Copyright Act (DMCA). Here is a template for one (yes, it’s ok to use this). Just find the host using a lookup service and fax the letter in. Some hosting companies make this even easier with an online form. Report them to Google. It’s perfectly legitimate to notify Google that you believe an unauthorized use of your copyrighted work is appearing in search results. It’s also perfectly reasonable for Google to blacklist them, removing them from all search results. The domain will never again appear in a Google search, even for the business name. Game over. Sue for damages. Not my style, but it may be appropriate. Contact a good attorney and have at it. Federal copyright laws, and potentially others, will apply. Aside from all of these legitimate, but negative responses, if you’ve ever had someone use your content without your authorization (or at least a citation of authorship), consider doing something positive and creative. My first instinct was to write this article and share my experience with others. But I’ve also made some new friends. I really connected with Blair and Mark from Newfangled, and I plan to keep in touch with them. What happened to differentiation? What happened to standing apart? What happened to being real? Being authentic? Being yourself? This is my friendly email of free advice to you on your business and your content strategy. A content strategy is something that is delivered over time. It is the byproduct of focus, exploration, learning and — time. In addition to getting you found through organic search and proving your expertise, it forces you to build expertise. In some ways, also, your content is a chronicle of your journey and development. From what you’ve done it seems that you are seeking to enjoy the benefits without doing the work, and it’s failing on a number of fronts. The pieces that you lifted almost verbatim read well, but they should – the original articles were written by people with years of experience based on hundreds or even thousands of hours of work, filtered through a strong point of view. But these are stolen properties that represent thousands of stolen hours from people whose time is worth hundreds of dollars per hour. Other articles where you’ve essentially rewritten in different words somebody else’s piece still constitute theft (to me, but it looks like a judge will be the final arbiter) and make a false claim to you having put in the hours, arrived at the understanding and developed the point of view. If you think it’s okay to do this because it doesn’t match your high school definition of plagiarism then you are about to find out just how wrong you are and how costly this behavior is. Further, these re-written pieces are painful to read. Instead of trying to develop meaningful expertise you seem to be putting all of your energy into building a facade of expertise. Your hurry to publish content without creating or even properly synthesizing ideas from others comes shining through. The remaining pieces on your site that were clearly “inspired” by my work are painful for me to read and I would never publicly claim them as mine but I still resent you taking them – they were written based on thousands of hours of practice and learning. I can’t imagine these are helping you in any way. You removed the articles that were lifted from me in whole or in part but there remain articles where you’ve taken my ideas which I publish for your use in PRACTICE not so you can appropriate and claim as your own – and you’ve done just that – claimed the ideas as your own. I’m a consultant; people take my advice (customized to their situation in a fee engagement and for free via published articles) but they don’t TAKE it the way you’ve taken it by rewriting it and claiming they were the originator. You seem to think highly enough of me to appropriate, if not follow, my advice and even to pay for a membership to my online learning center, so I’m going to give you some advice on rebuilding your firm moving forward. Here it is. 1. Take down your blog. My suspicion is that there is little true original content there so you might as well start over. If you’re not honest with yourself and not getting legal counsel I fear you’re going to try to get away with doing the bare minimum to escape consequences and I can tell you that if we feel your efforts don’t go far enough we will go after you with every legal means. You need to admit that your own judgment here has been poor. You don’t have to trust mine, but if you don’t you should be looking to someone else for help. That’s why God invented lawyers. 2. Pick a focus. I can tell by your keyword stuffing that you’re not following the most foundational piece of my advice (focus). In addition to stealing numerous articles from Newfangled, you have also taken their description of themselves. 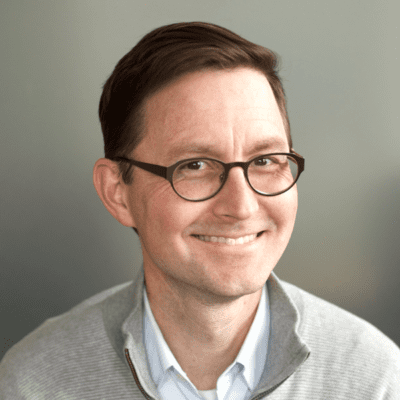 Newfangled can pull off a broad focus because they have tens of thousands of hours of building expertise, and they prove it through their thought leadership (which you’ve stolen). You need to retreat to an area that you can build a leadership position in. 3. Build expertise first, then write about it. It’s perfectly acceptable to get inspiration from others but you don’t read something and then sit down and try to replicate the article you’ve read. I have articles on my website that have taken me over a year to write but they’re rooted in my actual experience, and that’s why they are valuable. I hope you can make the corrections, admit your errors and take a more legitimate path to building a solid firm, but your window to do so is closing quickly. Well said, Blair. If you’ve had an experience with plagiarism (or just have strong opinions about it) let us know with a comment below. Thanks for sharing this… Really interesting especially for my industry where everyone that has a website will have quite similar content because we all post directions for our services that can only be written slightly different. Andy, this is a great article. Super helpful and comprehensive. It is sad to see how much plagiarism is happening. Andy-great article and sorry to hear about the plagiarism. I think your blog post is going to be seen by alot of folks and that these sites are going to have to take down their site and revamp it. I also saw someone signup on my website you guys built; they were a local Chicago web firm, guess they wanted to see how my site works. Great article as always, Andy. I have a client that recently went thru this same type of brand identity theft – theirs was a restaurant chain in Canada that lifted their overall identity… down to the interior design of their restaurants! They’ve gone the standard “cease & desist” route with their lawyers, hopefully their situation will be cleared up pretty quickly – but the copyright standings for US vs Canadian companies is a bit tricky, so we’re waiting to see what the lawyers can hash out. Great stuff, and thanks for sharing. Very useful info! 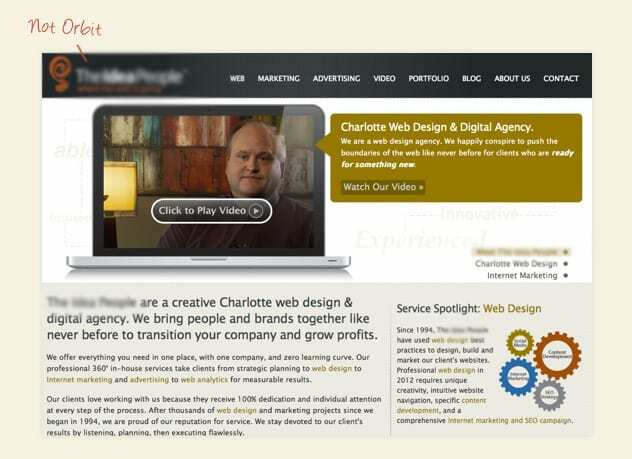 One thing I’m not sure on- I don’t know that something like “Charlotte Web Design Company” vs. “Chicago Web Design…” can be considered plagiarism. I see variations of this in my industry all the time — and it’s been ruled in court before that some things (like intangible concepts) can’t be copyrighted. Still, glad you caught the offenders! Another scary aspect of this, is from a client’s perspective. You may not be doing business with who you think you are. So, upon meeting with a service provider, one should make sure that their personal presentation is in line with their electronic. Hey Andy, great article, and solid advice. I also really enjoy the letter Blair put together – it was solid advice to them, forceful and even a bit humorous to me 🙂 This has happened several times to the content I have written for our website, so I feel your collective outrage. One other piece of advice to add – if the company that stole your content doesn’t provide contact information, use a whois look up to quickly find out who to contact. It really makes me sad to see all the hard work you put into the content and Shellie into the design be abused like that. Orbiteers work hard and put so much effort into what they produce and to see it so easily passed off as another’s is depressing. I’m glad to see that ‘Schmorbit’ has at least taken down their home page and blog at this point, but who knows who else out there is taking credit for other people’s ideas. Great way to make lemonade in this situation Andy. We’ve run into the issue several times as well and my personal favorite was calling one of the offenders up and explaining the situation. He was especially upset because he had paid a “copywriter” to create their content. It still had the acronym DTC in the copy! How are they going to go about designing and developing a site in 3 days? Good luck “Schmorbit”! Excellent article and this one hits close to home after what we went through a couple years ago. It’s sad to hear about all the people this happens to. If anyone needs a great internet focused copyright attorney, I’d be happy to share. She got our copycat site down in under a month. On a lighter note, I think it’s same to say your imposters look very much like the Moopets to your Muppets. Keep up the great work! Great post, Andy, and a serious problem that’s not going away any time soon. I’m really glad you posted the link to Copyscape. I’ll pass that along to my blog’s readers as well. And I’ll even give you credit, Andy! 🙂 Thanks again for a super post. One of the most frustrating things as the designer of the Orbit site, is to see the sad interpretation and deterioration of what we created and spent so many hours brainstorming together to make work beautifully as a team. That web process page design was so custom to our specific content…I remember doodling on notebook paper to see how it could work perfectly with each paragraph and Andi building the code around all the graphic pieces. Thanks Andy for an excellent article and to Blair for his email of advice to the thieves! I must say, I thoroughly enjoyed reading it. Congratulations, once you are in business long enough something like this will happen to you. My entire site was copied by a company in China in 2005. A company in the US took my online brochure, copied it, and redistributed it with their logo in 2009. Then I had portions of my book plagiarized in 2010. Unfortunately, this is just the way the world works and you can only react when it happens. I know your offended and you should be but this is happening thousands of times a day. Well said Andy (and Blair). Protecting our work is one of the most important things we can do these days. I love how well Andy and Blair handled this. Nowadays unique content is so critical and it’s sad to see someone just swipe it from you. I also know how many man hours went into designing and developing our site by the team. It’s unfortunate that there are people out there that are willing to take advantage of that. Way to drop the hammer in the utmost professional manner, Andy and Blair! We have to monitor their new website and perhaps do a follow up post. We all know they are just going to copy someone else’s site. Great article Andy. Thank you for the referral to the Copyscape tool. Unfortunately, this kind of theft is older than the word (1621 L. plagiarius). As CMO for a number 3 firm, behind two behemoths in the energy industry…, I once had a press release copied. Like the example you gave, this company left my corporate boilerplate with my company name in it. Their legal, PR and web teams missed that obvious signal – I guess they didn’t proof read to the end. The release stayed on their website for 6 hours, but not before it was the talk of the town from Houston to Dubai ! Blair and I were colleagues, 2 or 3 business lives ago. His clients swear by him, because of what he has laid out in this letter – he’s put in the time, banged concepts and results together to form a highly valuable offering. And, he will defend it in the manner that is appropriate to the situation – like you just picked up one of his children and started running for the woods. He was not always that way, but I, for one, am glad he decided to become part of the Not F__king Around Crew. Andy, great topic for conversation today… and also very well covered. I did a search for my site and found my opening paragraph (and several others) literally copy & pasted verbatim. Although, the companies were in Hong Kong and Pakistan. I just don’t think I’m prepared to get international with this! It makes me think to myself… am I an international sensation and man of envy that they should be blessed to have my journalistic meddlings adorn their business websites? In this case, I may just have to lean towards plagiarism is the best form of flattery… and then call it a day. Great post and comments, thread, Andy. The experiences of the last few weeks have been eye opening and it’s led me to begin to categorize the various forms of web plagiarism. Here are some, with appropriate penalties. The lifting of entire articles word for word with only the author’s name changed. The domain dumb thieves. Strengthen the gene pool: Off with their heads. 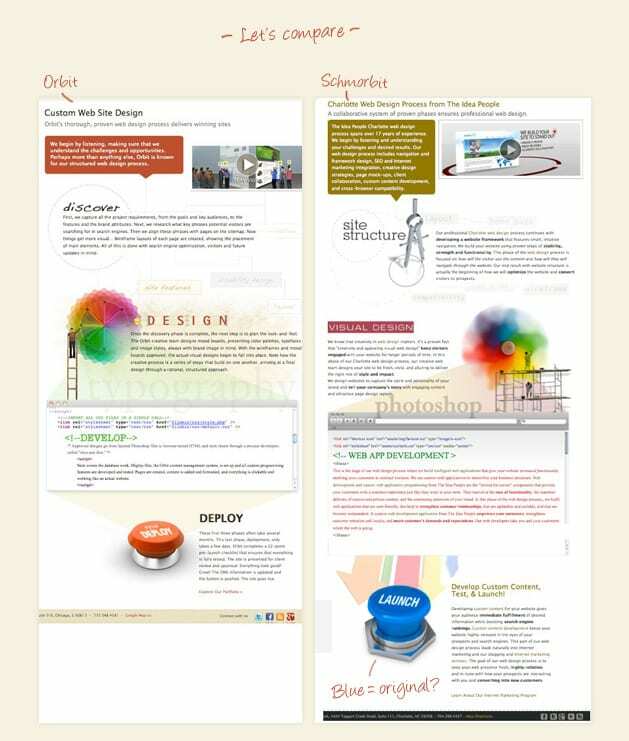 The lifting of entire articles, source code or site designs with only minor modifications. In some ways, even worse than above. Slice. Where someone takes your idea and attempts to rewrite it to make it his own. This is what I was largely addressing in the letter above. It’s still theft of the author’s experience and misrepresentation of the thief’s. Twenty lashes and as many lawyers. There are various levels of people trying to benefit from the goodwill of your name, and I’m adding it here because I had an interesting case of it recently when a competitor used my registered trademark for SEO purposes (in the meta tags, description and page title only) on an article on his website. It was clever but easily discovered. (Interestingly, he could use it fairly for PPC purposes.) Cease and desist. I’d be curious to hear from others on the forms I’ve missed and what they think the punishment should be. Thanks for providing the forum for this important discussion, Andy. Great article and has helped me with our design studio work as well…. startng to search for all our clients now! This was shared by my friend. A very good and thoughtful read. It amazes me how many people have never learned or have ignored ethical behavior and beliefs. I am in the fundraising business, and I have to be extremely ethical in my business practices, but when you read the news these days, so many of the issues that cause this nation the problems we have, you realize that much of them are caused by a lapse of ethical behavior. The really, really sad part is that the second I saw that persons photo I new exactly who it was. And I know them because 15 years ago they were another agency in my town and stole the identity of another agency from a design book, name and all. I know a few people that worked there and the stories were endless. After 2-3 years they left and what I hear is they went to Atlanta. Now they are in Charlotte. Very sad, email me if you want more details. Actually dont know really where to start. But someone else bought that domain. It is his property. they did not steal you anything. blogdallas.com does this ALL THE TIME. They copied my work. I spend at least once a month calling them out and notifying other writers that they are a victim. This blog is shameless. My website is http://www.ArgentineTangoWeddingDance.com and yes Mary An was right the Hong Kong website had copied my beautiful, very expensive hand made large banner company logo and was using it for their own purposes on every page of their website. I contacted my web designer and he said there’s not much I can do without a “boatload of lawyers” and even then enforcing copyright law between international entities he said is pretty futile. The av.com web address of the tipster seems to originate in Sunnyvale and that email address seems to be invented to be able to supply anonymous tips. Any ideas about what to do would be greatly appreciated. This is the second time someone has stolen my company’s logo. The first was a small co I found on FaceBook (based in China) that I finally got the FaceBook people to remove by sending numerous emails to them. Update to … someone stole my company graphic. The offending party did reply to the email that I sent to them detailing the fact that I paid my web design company for that graphic to brand my company and they did change out their banner to another graphic … so there was a happy ending to this one. @TangoTeacher I’m very glad to hear it. Some people who have commented on this post haven’t been as successful. @crestodina @TangoTeacher I too cancelled my BBB membership for both of my companies several years ago when I realized how they do business. This is a very interesting article. We recently paid a design agency to re-design/rebrand our website. The same agency then worked for a competitor and pretty much reproduced exactly the same design for them too! Any suggestions as to how we might respond to this would be greatly appreciated. @Magywch I would contact them and be direct. Point out the similarities in the designs and ask them sincerely if they understand your concerns. If they really just copied the design, they did a very bad thing for both you and the competitor. I can tell you from the point of view of the web design company, there are times when potential clients contact us and actually ask us to copy another site we’ve already done. “I like what you did for company x. Can you do that same thing for us?” We have to explain that we would never ever do that. It sounds crazy, but it’s possible that the competitor hired your vendor specifically because they liked your design! @crestodina Thanks for the response. I’m busily drafting a suitable email now. You could be right in your comments – this competitor has copied us before. There is also a distinct ‘flavour’ to the sites designed by this particular design company – which ironically is what attracted us to them in the first place! Thanks for the great post, and the sample letter! Once more tip: protect and prevent content theft , instead of just chasing down ©infringement after the fact. I want to check my whole blog for spun content, because its penalized by panda. please recommend any free tool to check. I didn’t found any web who can provide plag details via website url for all articles. I would recommend you to go for smallseotools. It is a free and a great tool to check plagiarism. Simply copy and paste your text directly into the Google search box and Google will search for copies of the text. You can also copy and paste your post’s title. It’s a simple but effective way to detect if someone has copied your post word for word. Great article, thanks. Excellent article, I am currently trying to halt a competitor in the Web development arena who is stealing both my content and ideas. When challenged he actually claimed I should be honoured that my blogs were so good they were being copied. i want ask one thing, if some one has copied our content, what steps i can do to get that content removed from his/ her website ? Amazing article! I have been copied so much lately and was really wondering how to remedy the problem. Thank you kindly for your awesome suggestions. I’m glad this was helpful, Angel! Hy Andy, Kindly guide me about one thing what if someone stole my content or put on website without my permission ? what steps i can take to counter such a situation? If it’s a blog post and they gave you attribution (a mention with a link back) it’s actually a good thing for your marketing. But if they copied your other content and made it look like they created it, than I recommend you follow the steps above, starting with a letter. I had a friend use vacation photos that I took for her blog. She gave me credit for most of the photos, but there are several that credit her. It makes me cringe. The first time I sent her a letter, it turned into a nasty exchange. I am now getting ready to put them up on an image site for sale and find myself in the position of having to revisit the photo credit issue. At this point, I would rather she not use them at all. I hate being put in the position of having to call her out. Thanks for posting this article. Very helpful. Since it is now 2015, and I believe the article is a few years old, I’m wondering if you still recommend CopyScape as the best resource for plagiarism detection. Thanks for the great article. I was conducting some research because a wanna-be competitor lifted some lines of text from my site and put them on her site, AFTER she called me pretending she was a potential client seeking my services. Your article reassured me that the measures I’ve been taking are not over the top. I loved the letter you included in your article, too. Perfect! Hi. I begin work tomorrow as Business Development Manager with a consulting firm. During my negotiations with the President of the company, he shared with me that a competitor copy his entire website, basically. The only real change is the company’s name. As a recent college graduate, I told him that was pure plagiarism! The owner is an older gentleman and small business owner who asked me “What can I do about it?” I decided to research the subject and came across your site. I am not sure about the copyright status of my company’s website but think it is quite unethical of the other company, regardless. May I communicate with you more about this for advisement? Have a look at http://www.whocopied.me. It is similar to copyscape, but it is free and it monitor all your content and tells you where it gets published realtime. Finding plagiarism can be a difficult task sometimes, but don’t worry, I am here to offer you a simple solution for all your problems with it. Plagiarism checker at https://writingpeak.co.uk/plagiarism-checker can detect any type of plagiarism possible really fast. And what’s most important is that it is free to use. You won’t find an offer that’s better than this one.